Strategic simplicity has power - Susan Said... WHAT?! So, I’m thinking ahead to the American Idol showdown between Adam and Kris tonight and I happened upon InStyle magazine’s great online piece showcasing American Idol transformations. The one thing that immediately jumped out at me is that the old adage really is true – strategic simplicity has power. All of the Idols (and runners-up) look fine in the “before” shots. But every single “after” is cleaner, crisper, more polished and simply more powerful. Of course, even the most fabulous ensemble will look atrocious if the garment isn’t fitted properly. Too tight and a dress rides up at the midsection. Too loose and a jacket bags at the shoulders. This is especially important for any event where you’ll be seen from various angles (isn’t that every event?). Finally, the restrained use of accessories is extremely important and one area that can instantly ruin a look. In every “after” shot accessories are used not to distract but to add a punch of interest. It’s the difference between wearing a set of small earrings, a necklace, a watch, and an armful of bangles — to wearing just one, spectacular statement necklace showcased on a field of solid color. These tricks are certainly not new. In fact, one of my favorite pieces of fashion sense is from Marilyn Monroe – the original “American Idol”. She advised to get completely dressed, walk away from the mirror, and turn quickly to get a glimpse of your image. Whatever the eye goes to first – a necklace, a scarf, an overpowering jacket – take off. Simplicity. Instant sophistication. And very, very Idol-worthy. Body con dress by Simlu is easy-care, incredibly useful, and only $8.99! 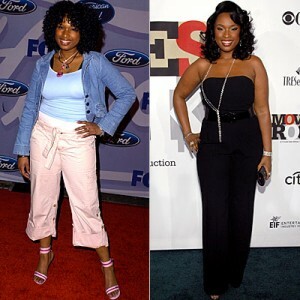 Separator image Posted in WOMEN'S FASHION and tagged with American Idol fashion, before and after style transformations, makeovers, Susan Said What? !, transformations, women's fashion style beauty.